Celebrating the built history of one of Ohio's great small towns! The Gill House was constructed in the 1902-1904 period for Bloomer and Nellie Stewart Gill, and is located at 342 Harding Way West, the main street of Galion. Constructed by local contractor John King, who also built the Big Four Depot and Galion Public Library in the same decade, the Gill House was designed by noted Detroit architect Louis Kamper. Kamper had trained with the renowned architectural firm of McKim, Mead, and White in New York City, and particularly under Stanford White. After arriving in Detroit, Kamper’s career focused largely in two areas — designing magnificent residences for the city’s cadre of rich executives, and creating plans for the city’s most glamorous hotels. The latter includes the Book-Cadillac, arguably the crown jewel in Detroit’s amazing collection of Art Deco architecture. The Gill House is one of only two known Kamper residential designs to be built out of Michigan, and the only one in Ohio. It is also the only known Kamper designed home to currently be open to the public. The house was purchased with funding assistance provided by the Galion Historical Society. Preserving Galion History, LLC thanks the Society for their foresight in assisting in making this landmark home a part of our community’s future. The first Gill to arrive in Galion was David Gill. He came to this area in 1818 with his brother in law George Wood. George Wood helped build the area’s first schoolhouse of logs and clay and James Gill became the settlement’s first teacher. The schoolhouse was said to be located on what is now Harding Way West just beyond Gill Avenue. David Gill was married to Catherine Wood, and they had at least one son, James Woodgill Gill, and a daughter Catherine Gill. James Woodgill Gill was born 1823 in Galion and died April 24, 1866. He was married to Louisa M. Baker. Louisa was born March 17, 1831 to Aaron Baker and Mary Davis Baker in West Marlborough, Chester County, Pennsylvania. Louisa was raised in the Society of Friends, (Quakers) and later joined the Methodist Episcopal Church. James & Louisa had four children: James Woodgill Gill, Jr. who died at the age of 17, Bloomer Baker Gill, Carrie Gill, and Jay Gill who died at the age of 18 months. James & Louisa purchased 160 acres of farmland on the west edge of the village of Galion. Mr. Gill was involved with securing the railroad though Galion which contributed to its rapid growth prior to the Civil War. Mr. Gill decided to divide his farmland into building lots but he died before his plans came to fruition. 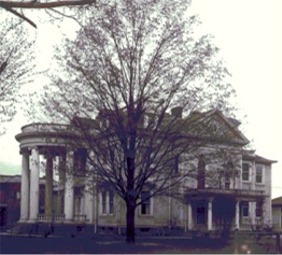 His widow (Louisa) carried out his plans and laid out Gill’s addition to the city of Galion which became the foundation of the family’s fortune. Gill’s addition included obviously Gill Avenue and also what is now Walker, Erie, and West Church Streets and Park Avenue. The area around what is now the Community Center YMCA was known as Gill’s Park and featured stately brick columns at the entrance to the park with large wrought iron gates. After the death of Galionite Frederick Heise who bequeathed money to his adopted hometown, Bloomer Gill sold the land west of Gill Park to the city to enlarge the park and it became know as Heise Park. Mrs. Gill moved to Dixon, Illinois in 1885 to be near her daughter Carrie and shortly thereafter married Theron Cummins. Dixon was the boyhood home of Ronald Reagan. Bloomer Baker Gill was born in Galion October 19, 1859 in the original Gill house that now stands directly behind this house. In his earlier years he was engaged in the hardware business with H.C. Sponhauer. He later was in partnership in a drug store with C.D. Spalding until they sold out to Edward Seeman. He then became involved in the manufacturing business. He served as secretary treasurer of the Howard Motor Car Company until it merged into a new corporation known as the Cleveland-Galion Motor Truck Company. Bloomer was a charter member of Elks Lodge No. 1191 in Galion. Bloomer married Nellie Stewart on Feb 28, 1885. Nellie Stewart was born on September 7, 1863. She was the daughter of Alonzo M. Stewart and Hannah McClelland Stewart. Mr. & Mrs. Stewart came to Galion from Boston, Massachusetts, and were originally from Maine. A.M. Stewart was the superintendant of the railroad and built a mansion on South Market Street that is now home of the law offices of Hottenroth, Garverick, & Tilson. Mr. Stewart became very active in the Methodist Episcopal Church after attending a tent revival. He became involved with the Chautauqua Institution in New York. Mr. Stewart became close friends with Mansfield industrialist Lewis Miller who was a co-founder of Chautauqua. The Stewart and Miller families spent their summers at Chautauqua. Mr. Stewart’s daughter Nellie became lifelong friends with Mr. Miller’s daughter Mina who would become the 2nd wife of America’s greatest inventor, Thomas Alva Edison. Nellie was an active member of the First Methodist Church and was a longtime member of the Olentangy Chapter of the Daughters of the American Revolution. She was also a longtime member of the Fortnightly Club. Mary L. Gill was born on Feb 28, 1888 in Galion. She graduated from Galion High School and Miss Phelps English and Classical School in Columbus, Ohio. She was married to Howard Ross in Galion by Rev H.E. Bright on Nov 20, 1920 and later divorced with no children. Mary lived with her mother Nellie. She died on May 20, 1951 in Galion. Isabelle Stewart Gill was born July , 1890 in Galion. She graduated from the Hathaway-Brown School in Cleveland with the class of 1910. Hathaway Brown founded in 1876, is the 2nd oldest college prep school for girls. Among its alumni are Congresswoman Ruth Hanna McCormick, daughter of US Senator Mark Hanna and Margaret Hamilton, the wicked witch from the Wizard of Oz. Isabelle was also a classmate of Frances P. Bolton, the first woman to be elected to Congress from Ohio. She married Earl Williams of Cardington Ohio on June 9, 1913 in Galion. They had a daughter Mary Jane Williams Vail who is living. Mina Miller Gill was born in 1889 in Galion. Bloomer and Nellie named her after Nellie’s childhood friend Mina Miller, the second wife of Thomas Edison. She graduated from Galion High School and attended art school for several years in Chicago. She had a decided talent in portraiture. Mina was married to J.W. Pitken in Galion by Rev L. Hart on June 7, 1916. The Pitken’s moved to Norwalk where they owned Pitken Jewelry Store for many years. Mina died on July 30, 1980 in Norwalk. James Cummins Gill was born in Galion on July 23, 1892 and died November 2, 1965. As a young boy, Jimmy became interested in motorcycles and had one of the first in Galion. He was known as quite the daredevil. In his earlier years, Jimmy worked at the Globe Clothing Store. He later owned a jewelry store in Galion and sold real estate for Glenn Richardson. Jimmy married Olive Thuma at the United Brethern Church in Galion, Ohio on June 17, 1928. Olive was the longtime librarian at the Galion Public Library. Jimmy & Olive had two sons, John Stewart Gill and David Cummins Gill, both graduates of Galion High School. John spent his entire career with General Motors, helping to install GM’s first computer system. He retired as a Vice President. After graduation, David moved to New York City to pursue an acting career using the stage name of David Cummins. He appeared in several Broadway shows in the 1960s as well as several television shows. He also did television and print commercials. During his time in New York City, he lived with an aspiring actress named Bernadette Peters. He died in 2013 in Galion. The Gill House was designed by nationally known Detroit architect Louis Kamper. Louis was born in 1861 in Bavaria and came to this country with his parents in 1880. Upon their arrival, he went to work as an apprentice architect with the legendary firm McKim, White, and Mead of New York City. He learned of the growing architectural and construction industry in Detroit and moved there in 1888. He quickly established himself with the firm of Scott and Scott. He quickly showed his skills with one of his first commissions, the Col. Frank Hecker in 1889. He was made a partner in the new firm of Scott, Kamper, and Scott. The Hecker Home made Kamper a premier architect and designer among the wealthy in Detroit. He received commissions from such notable families as the Bagleys, the Merrills, the Tullers, and the Books. In 1901 Kamper designed the Michigan building for the Pan American Exposition held in Buffalo, New York. He was commissioned to design a home for Solomon Dresser of Dresser Industries of Bradford, Pennsylvania. Sometime in 1902, Bloomer Gill commissioned Kamper to design his new mansion. The Gill mansion shows similar design features to the Dresser mansion as well as the Hugo Scherer House in Grosse Pointe Shores, Michigan. Bloomer chose local contractor John King to build his new mansion. John King was the son of Joseph King who was a longtime Galion businessman. John King was the contractor for the Big Four Depot as well as Galion’s Carnegie Public Library. In 1916 Louis Kamper designed the Italian Renaissance style Book Building. This successful project led the Book Brothers to commission their family estate followed by their most aggressive project: turning Washington Boulevard in Detroit into the Midwest equivalent of Fifth Avenue in New York City. This led to Kampers commission of the Carleton Plaza Hotel in 1923. The Carleton holds and importance in Detroit’s architectural history. The layout of the hotel featured a u shape so that every room had an outside view, not a common feature of hotel design at the time. It also featured individual bathrooms, another uncommon feature of the time. Using his experience designing the Carleton, Kamper then designed the Book-Cadillac Hotel. When it opened in 1924, it was the largest and tallest hotel in the world and became the benchmark for all hotel designs that would come after it. After the success of the Book-Cadillac project, hotelier Lew Tuller commissioned Kamper to design 3 hotels, the Eddystone, Park Avenue, and the Royal Palms hotels, all designed in 1924. The Book brothers then hired Kamper to design a companion to the Book Building, the Book Tower in 1926. He also designed an 81 storey Greater Book Tower that was never built due to the Great Depression. Kamper designed more than 100 commercial and residential buildings in Detroit during his career. Unlike his peers, he ventured into the Moderne Movement (which later became known as Art Deco) with such projects as the Waterboard Building (1928) and the J.M.Schaefer Building (1930). The designs of Kamper is one of the reasons that Detroit has the third largest collection of pre-World War II residences, commercial buildings, and skyscrapers in the world. His legacy helped define Detroit of the 20th century and survives into this century. Louis Kamper died in 1953, 16 days shy of his 92nd birthday. His was interred in the mausoleum he designed in Roseland Park Cemetery and is laid to rest next to his friend and patron, James Burgess Book, Jr. His archive was destroyed shortly after his death so the original Gill House drawings could be one of the only surviving in existence. According to one of Bloomer & Nellie Gill’s granddaughter, Mary Jane Williams Vail, Henry Ford was acquainted with her grandfather and in fact, came to visit Bloomer Gill in the earliest years of the 20th century. It is said that Ford drove into Galion with what was the first automobile seen in Galion. According to the late Olive Gill, Bloomer & Nellie’s daughter in law, Henry Ford, Thomas Edison, and Harvey Firestone stopped at the Gill House for lunch in August 1923 after attending the funeral of President Warren G. Harding in Marion. Click on any image for larger view. More photos of the Gill House are coming soon.